In the end, it was likely a four-man race for one All-Star spot. 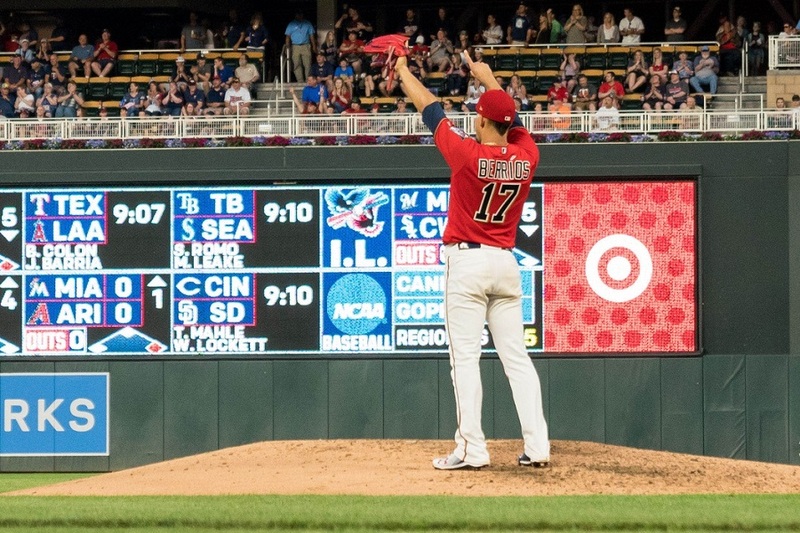 Jose Berrios, Eduardo Escobar, Fernando Rodney, and Eddie Rosario were all having strong seasons but Minnesota’s lackluster first half meant that only one would be selected to the initial roster. Who made the cut? And who still has a chance to make it? Jose Berrios will be an All-Star for the first time. In his age-24 season, he has gone 8-7 with a 3.54 ERA. He has 114 strikeouts in 114 1/3 innings pitched and his 26 walks allowed have resulted in a tidy 0.997 WHIP. He leads the league with two complete games. Before the season started, some off-the-wall predictions were made here at Twins Daily. Berrios might be the only one who comes to fruition. He’s been able to do this by cutting his walk rate from 3.0 BB/9 in 2017 to 2.0 BB/9. Berrios has also improved his strikeout rate. Entering the season he had a career 8.3 SO/9 and he has posted a 9.0 SO/9 so far in 2018. Eddie Rosario will have a little more of a challenge to make his first All-Star team. He is part of MLB’s Final Vote, which allows the fans to add one player to the roster of the AL and NL squads. Rosario faces off against Andrew Benintendi, Jean Sugura, Andrelton Simmons, and Giancarlo Stanton. It’s going to be a tough road for the Twins outfielder as many of those names are better known. However, his fWAR ranks as the ninth best in the American League with Simmons being the only Final Vote candidate to rank higher. Rosario leads the Twins in most offensive categories as he seems to be having a coming-of-age season. For now, he needs the help of fans voting him in or an injury to a starting player. Did Major League Baseball get it right? Should Berrios be the team’s selection? Did Rosario get snubbed? What about Escobar and Rodney? Leave a COMMENT and start the discussion. Rosario got snubbed, at least a little. He's got better numbers than Michael Brantley, but that's what happens when you're on a losing team. I think Eddie, Eduardo, Jose, in that order. But Berrios is a cool selection. It is fine.Giancarlo Stanton is on the outside too!In the long run, the all star game is a little vacation in the middle of the season and not much more. More than a little, but the team performance definitely hurt him. Brantley must be a popular guy amongst the players to be voted in outright. I've gone to mlb.com and voted for Rosario, have you?? Wow I did not realize Springer was having such an off year. That's even worse than Brantley getting in. Springer was having a good year until the last 2-3 weeks where he can't buy a hit. Brantley was doing pretty amazing as well but has fallen off some in the same time frame. Poor Eddie has no shot against Stanton and all of New York voting. Rosario needed to be the mandatory pick from the Twins. I would have picked him. Berrios should have an 11-4 recrod if it wasn't for the bullpen. Rosario has no chance against the others in the final vote. I would pick Simmons if a gave a crap about how the vote works now. Just voted. If you read the fine print at the bottom, people who vote will get a free, non-renewing two-week subscription to MLB-TV for July 12-26. So that is something. These guys should take their snubs, take a vacation, and then come back and do something real special. You know what I would actually watch? A four team round robin. The other two teams would be a team of snubs voted on by the players, and then the fourth team would be put together by the Fangraphs guys. Or something like that. Each player would pick a small town or neighborhood to play for, and if they won, every kid in that neighborhood gets baseball equipment. If they lose, they don't get nothing, not even a trophy. I’d actually watch that. There are so many things they could do, but won’t, to actually make it a true ‘best of the best’ game to watch instead of teams based on fan base. The players are among those already doing the snubbing- they choose the reserves. So players picking more players isn't going to solve the issue of snubs. The whole All-Star mentality is a pretty unrepresentative, anyway. An all-star really isn't a player that is just hot the first 3 months of the year. The guys that end of with the best lines on the year, but started slower and ended hot when it counts, down the stretch, but start the next season slower than their average, really are more of an all-star than one 3 month stretch. But people cry snub if a player really hasn't established himself yet. Plus, long term is more important than a flash in the pan 3 months. And then there is the mandatory picks from each team that puts players like Kintzler, Capps, and Cuddyer, and a slew of players on other teams that might be having the best season for that horrible team, but it is still pretty lame considering what one likes to think of an all-star as. Rosario's season, so far, is way better than Cuddyer's was the year he was the mandatory pick. Berrios fits this, too, unfortunately. He is having a very good season, but not an really who one considers an all-star, yet. I hope one day he will really earn it because he has a couple seasons of consistent good pitching, and now a season where he is truly an ace at the top of the league with the other aces. It has got to feel tons better when you know you have really earned it, instead of gotten in because of the technical weird rules. The call to vote for someone that is not really an all-star is something I don't really care about. But I know millions do. That is why we get all-stars that are not really all-stars. That and OCD fans can vote incessantly, instead of just once. It really has become ridiculous. Yes, the all-star game has become a meaningless joke, unfortunately, IMO. It's 100% pageantry, zero substance. That's fine, if that's what they want is a popularity contest. That obviously appeals to a lot of people, does nothing for me. But under those parameters, there is no such thing as a snub. It's no longer a representation of the best players, it's no longer designed to be. Rosario didn't get snubbed according to what the All-Star game is now. Its purely a popularity contest, and he's not yet popular enough. That's true for all sports. Who cares. It's not meant for us. It's meant for the 10 year old version of ourselves that thought it was really cool all of the stars were on one field. At least the game doesn't determine who gets home field advantage in the World Series. Which may be the dumbest sports decision ever. Thanks for the tip. I wasn't going to vote but now I am. And back when I was 10 yrs. old. they actually played to win!